A stuffy, runny nose is the quintessential cold and flu symptom, and it’s often the first to strike. In fact, nasal congestion seems to be the catalyst for a number of different cold and flu symptoms, from sore throats to headaches. Why do we get stuffy noses when we’re sick? The ‘stuffed-up’ feeling you experience when you’re sick is a result of irritated nasal passages that become inflamed. Your immune system responds to a cold or flu virus by overproducing mucus as a way of flushing out the infection. This mucus can build up causing pain and swelling in the sinuses which may cause sinus headaches and/or contribute to post nasal drip – a common culprit in many sore throats. Nasal congestion with a runny nose can also be accompanied by frequent sneezing. Like the overproduction of mucus, sneezing is the body’s attempt to rid itself of a perceived irritant by stimulating the nasal nerves. 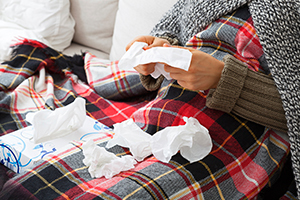 Note that sneezing is a common symptom of a cold, but is not usually present with a flu virus. A cold or flu virus attacks on multiple levels, and nasal congestion and a runny nose are just a few of the symptoms of this battle. That’s why a maximum strength, multi-symptom OTC medication like Contac® Cold + Flu Night is so effective at relieving your most bothersome symptoms. 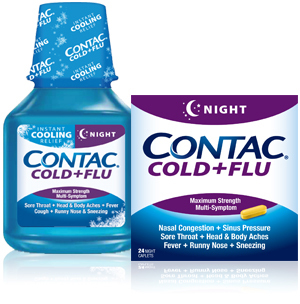 The unique combination of a decongestant and an anti-histamine in Contac® Cold + Flu Night can effectively control your nasal congestion and runny nose in a single dose. Drink lots of fluids to thin out your mucus. Use a humidifier or vaporizer, or carefully breathe in steam from a pot on the stove. Use warm compresses on your face to relieve discomfort and open your nasal passages. Keep your head elevated while sleeping to facilitate draining and make breathing more comfortable. The next time experience nasal congestion and a runny nose, those telltale symptoms of a cold or flu, reach for multi-symptom Contac® Cold + Flu.